Life insurance can be a vital financial protection in uncertain times. Unfortunately, many people never look into it, either because they don’t want to face the uncomfortable topic of death or because they think life insurance coverage is too expensive. Looking at the $35,000-$100,000 income bracket, fewer than half of Americans aged 25 to 64 carry a life insurance policy. 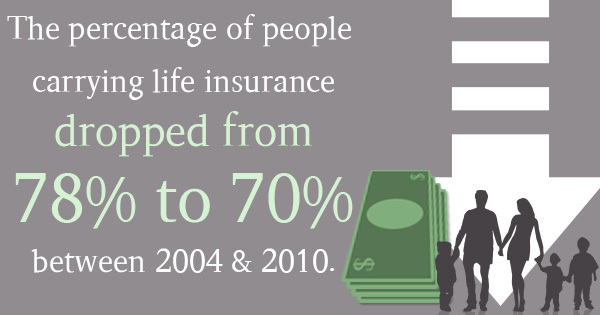 And unfortunately, trends may be getting worse; the percentage of people carrying life insurance dropped from 78% to 70% between 2004 and 2010. The good news is that life insurance carriers often offer policies at much more reasonable rates than you might expect; people tend to think that life insurance will cost about three times more than it actually will. The bad news is that life insurance can be confusing and intimidating if you’re not already familiar with how it works. Insurance providers offer two kinds of life insurance. The first is term life insurance, and it’s simpler to understand. Under this system, you purchase a policy that is valid for a set amount of time. The death benefit — the amount that would be paid out if you passed away during that time — is weighed against your age and health history to determine your premiums. As long as you keep paying those premiums, your beneficiaries can receive that death benefit. The other type of life insurance, whole life insurance, is a bit more complex because it includes an investment component. This can be a significant benefit, as you can use that money throughout your life on a tax-preferred basis. However, the premiums are often higher for whole life insurance. You should also keep in mind that insurance carriers or agents often make more money by selling you a whole life policy, so you need to do your research to make sure you agree that it’s the best decision for your situation. There are essentially two ways of determining how much life insurance coverage you need. (Of course, this will be individualized based on why you are getting life insurance in the first place, but most people get life insurance so that their dependents wouldn’t face financial hardship if they passed away prematurely.) One is calculated to provide income replacement. First, you must estimate based on your age how many years of income would be lost if you passed away — if you’re 40, for example, that might be 15 or 20 years. Then you multiply that number by your current yearly income. The other method of calculating coverage is needs-based, and generally produces a lower number than an income replacement approach. This involves a much more complex set of calculations involving whether any of your dependents would choose to work after your death, if any of your dependents would come of age and be self-sufficient, if you have any assets or debts to consider, or if expenses such as education are likely to arise in a set period of time. Do you have any advice on how to choose among life insurance carriers or get the best life insurance policies? Call Us Today or request a quote online.